Recent warming throughout the Arctic has resulted in significant decreases in sea ice extent, thickness and duration (Fig. A) leading to warmer land temperatures that further facilitate permafrost melting. The combined loss of sea ice and permafrost are likely causing increased erosion and sediment delivery to the coast that will have long-term impacts on coastal geomorphology and estuarine ecosystems. Determining the character and magnitude of warming induced changes to Arctic coastal environments is critically important given that they are vital spawning and nursery grounds for fish harvested offshore, and nearshore fisheries that sustain coastal communities. The Alaskan Bering Sea coast supports some of the highest concentrations of indigenous populations with a subsistence lifestyle dependent on the high productivity of the coastal habitats. However, we lack a fundamental understanding of how sea ice and permafrost variability influences coastal landforms that play an essential role in controlling estuarine processes, like protective barriers and bay-head deltas. The key question driving our research here is: How will Arctic coastal landforms and estuaries change as a result of potentially dramatic reductions in sea ice and permafrost? In order to address this question we must examine past coastal responses to climate variability by using detailed paleoenvironmental and paleoclimatic reconstructions that span the last 5000 years. Further, we apply both geomorphic and climate models to help interpret the paleo-data and project potential future changes to coastal systems under a variety of climate scenarios. a) Total maximum (green) and minimum (blue) ice extent from 1870 to 2003 with thick lines highlighting low-frequency trends. Vertical dashed lines highlight fundamental changes in the data: 1870-1952 (low resolution data); 1953-1971 (general hemispheric observations); and 1972-2003 (satellite period) (from Kinnard et al., 2008). 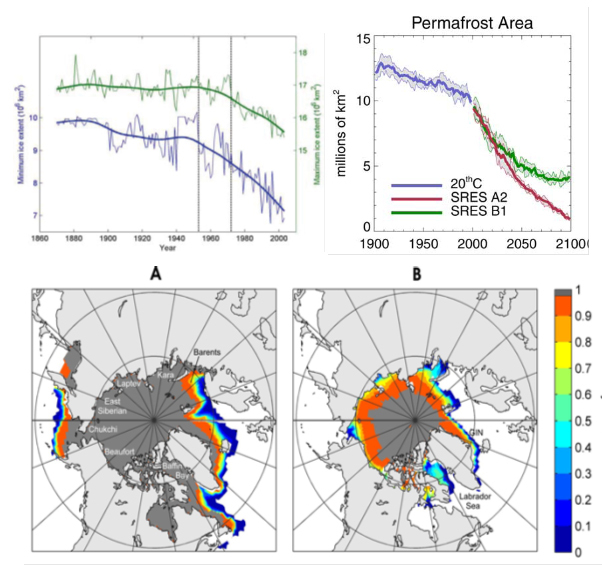 b) Simulated time series of global permafrost area, grey shading refers to the ensemble spread (from Lawrence and Slater, 2005). c) The probability of ice edge occurrence for (A) maximum and (B) minimum ice extent from 1870-2003. Grey areas define 100% chance of ice present (from Kinnard et al., 2008).